The slogan to the Education Rising at Aurora University program is “There’s Power in Teaching.” Thursday, students in that program showed there is power in fundraising as well, when they presented a check for $555.25 to Mooseheart from a recent fundraising event at area Chipotle restaurants. 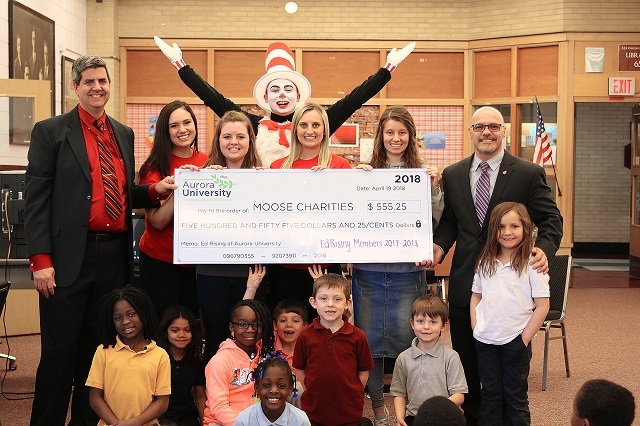 The fundraiser, during which a portion of sales was set aside for Mooseheart, was set up by the Aurora University students as a way to show their gratitude for their experiences in helping advance reading initiatives at Mooseheart. Mooseheart librarian Mary Miller said the students came to read to students three times. The first was during the October “Read for the Record” program, in which one book is chosen to be read in schools across the U.S.
“They called and said their students would plan and run the event and could they read to our students? I said sure!” Miller said. “I was really surprised when they said they felt they wanted to give back, because they have already given so much. They’re already planning and looking forward to coming back again next year,” Miller said. Miller said that Mooseheart’s students benefitted greatly from the efforts of the Aurora University students. Reading has been a long-term emphasis at Mooseheart, where many students arrive reading below their grade level. “Our students get to have reading-centered activities that aren’t just led by me, their teacher or their family teacher. It’s someone totally different and our students love to do things with different people. I think it helps that they are college students, and our kids get really excited to be around them,” Miller said.